For many years, Aetna produced formal shirts. We work with basic broadcloths, and for bibs, collars and cuffs we can use elegant contrasting fabrics including pique, satin, gabardine, basketweave, Charvet, Lampas, taffeta, or dobby cloth (small geometric patterns). We have access to basic fabrics as well as elegant high-count fabrics from Europe and the Far East. As we launch our own shirt line, we are starting with our cotton-rich blend fabric (60% cotton and 40% polyester) wash and wear formal shirt. 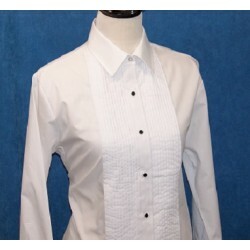 The shirt has a laydown collar, a bib with 12 pleats per side, and standard rounded cuffs or squared French cuffs.